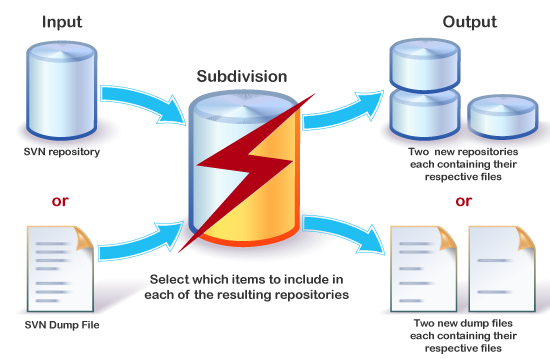 Subdivision can be used to split an svn repository into two part-repositories. This can be especially useful when organizational changes or legal issues dictate that two distinct repositories be used going forward. 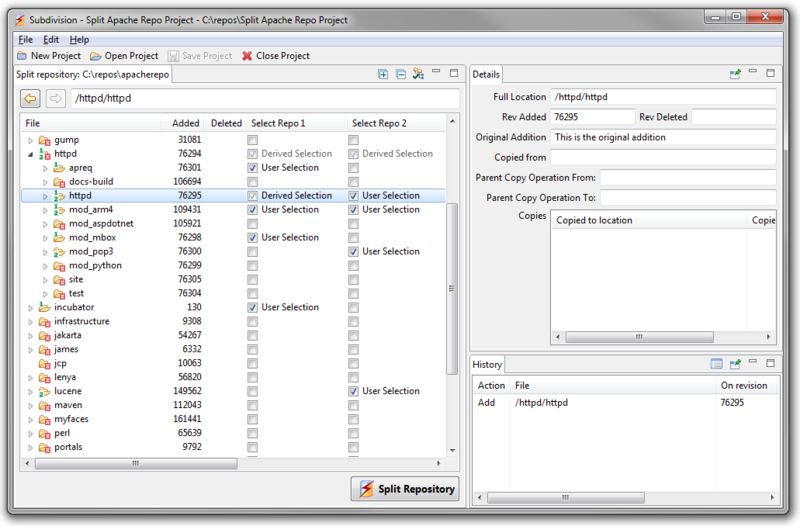 It can also very useful when the administrator chooses to move unnecessary or bulky files into their own repository. This will speed up backups of the main repository and have significant financial benefits by allowing the administrator to move the secondary repository to a lower tier storage and back it up less often. Using sophisticated algorithms that analyze the svn repository’s data structure, Subdivision will make sure that both repositories will have the required files in each output repository by intelligently including certain files in both repositories if deemed necessary. Subdivision is flexible enough to work directly off the svn server files or from a dump file and can generate either two svn repositories or two dump files as output. And of course the operation is extremely safe as the original repository is never modified so it can be archived away once the administrator is happy with the two output repositories.